Have you ever left work feeling deflated, the feeling that you’re just going through the motions at your job each day? Have you thought about starting something of your own, a side hustle perhaps, or doing something more impactful with your talents, but you are afraid that it may fail, it may be a step backwards for your career, and may not bring in steady income? Have you wondered why your efforts to land new job opportunities haven’t gained traction and don’t know why? You’re not alone. Over 70% of employees are not engaged with their work, and find themselves feeling unfulfilled. No doubt you have contemplated making a career or job change. However, without clarity or inspiration it can be tricky to know where to start. Be one of the first Vancouverites to join the Career Reinvention Bootcamp! Join Iris Cai in this highly interactive full-day workshop designed specifically for professionals and entrepreneurial-minded individuals like you who want clarity, inspiration and motivation on your career/business decisions and options. Together, we will explore where you are right now in your career and where you skills and interests could take you instead. The Bootcamp is different to traditional career counselling as it focuses on visualizing, mapping out potential paths and personal action planning for how to get there, and we walk through all of this step by step. The Career Reinvention Bootcamp uses design thinking (a problem solving technique typically used in product/service innovation) and draws inspiration from the international bestseller, Business Model You, to help you produce “personal business models” that empower you to adapt to ever-changing needs of the marketplace and create new career possibilities. Your current job is losing its appeal to you. You'd like to move to a different role and would like some support to map out your plan. You want more out of your life and career, but still haven't found that purpose, that calling, to channel your energy and creativity. You want to start something of your own but don't know how to make it happen. Have a much clearer understanding of your personal brand and what career/business options are most aligned with your purpose, strengths and interests. Create a personal framework and roadmap to help you organize your thoughts and plans that you can refer back to time and time again as you move towards your new career goals. Develop skills to manage your career in an agile way. Become much more confident in promoting yourself in your resume, cover letter, interviews, LinkedIn profile, and in creating a network of people that support you. Gain motivation and support from a community of like-minded people with diverse backgrounds. Imagine how good you will feel when you could finally say that you are in a career/business where you THRIVE, rather than SURVIVE, and actually having an action plan to make it happen. Iris Cai is a professional coach and workshop facilitator passionate about helping professionals and entrepreneurs create a life and career that matter. As the Career Coach for University of British Columbia's MBA program, founder of Bolt Careers and Iris Cai Coaching, , Iris has over 10 years of experience in various marketing and people development roles in organizations such as TELUS and Right Management. Iris's diverse corporate experience and aptitude in understanding product personas and marketing strategies have successfully enabled her to help hundreds of her clients discover the true essence of their humanities, chart their career paths and craft and market their personal brands. A pen and a letter-sized notebook/clip board to make your writing easy. We will provide a handout for you to do exercises on. 30 minute 1:1 post-bootcamp coaching call with Iris (valued at $100) to help with your next steps. 10% donation to Room to Read, a global non-profit dedicated to girls' education and children's literacy in low-income communities in Asia and Africa. Room to Read believes that World Change Starts with Educated Children®. Small investment - FLASH SALE expiring soon! Sam Middlewood is a former aerospace engineer from the United Kingdom and attended the Career Reinvention Bootcamp in February 2018. 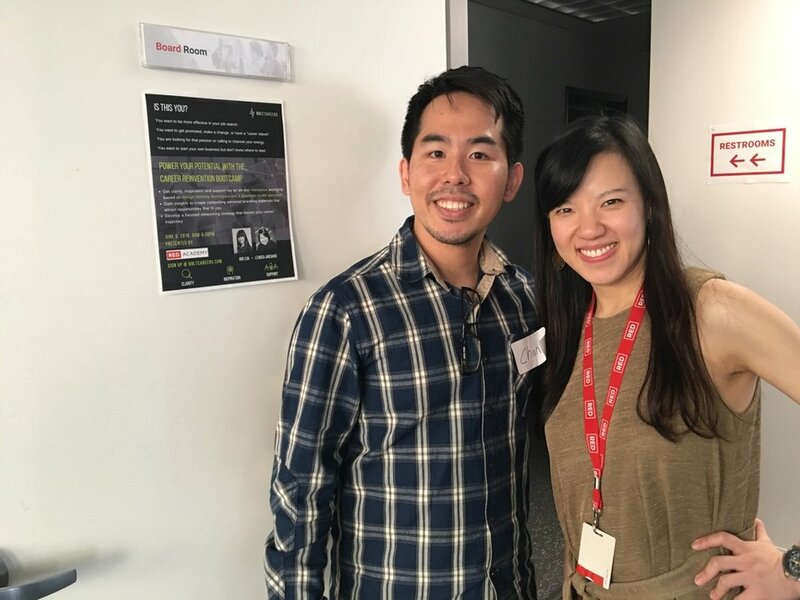 Hear Sam’s story on how the Bootcamp motivated him to pursue his entrepreneurial venture. Allison is a marketing professional from Vancouver, BC and attended the Career Reinvention Bootcamp in February 2018. Hear what Allison has to say about how the Bootcamp gave her ideas, clarity and action plans on how to advance her career with her current employer. Watch this video to learn about Iris’ career journey since she arrived in Canada, and how it has inspired her to found Bolt Careers to help people who want to live a life and career that matter through her interactive design thinking workshops. Book a free sample session with Iris Cai at www.calendly.com/iriscai to see if 1:1 coaching is suitable for your needs. Let’s chat :) Schedule a call with Iris at www.calendly.com/iriscai. Alternatively, drop us a line at info@BoltCareers.com. Hitting almost the mid-point of 2018, have you wondered what can be done to get more out of your career? Have you contemplated having a bigger change, but don't know where to start? Design thinking is a problem solving technique for "wicked problems" ‐ ones that we have no set-in stone answers for and things could change throughout the process. Doesn't our lives and careers fit such a definition? Forget about old school career counselling and join Iris Cai in this highly interactive full-day workshop designed specifically for mid-career professionals and entrepreneurial-minded individuals. The Career Reinvention Bootcamp uses design thinking techniques and draws inspiration from the international bestseller, Business Model You, to help participants produce “personal business models” that empower them to adapt to ever-changing needs of the marketplace and create new career possibilities. This iteration of the Bootcamp is generously supported by our partner, RED Academy, and we guarantee it to be a fun and inspirational way to spend a Saturday! Your crave career success but your current job is losing its appeal to you. You want to start your own business or a side gig, but don't know where to start. You are driven, curious and want to create a career authentic to you and to make an impact. You will have a much clearer understanding of your personal brand and what career/business options are most aligned with your purpose, strengths and interests. You will become much more confident in promoting yourself in your resume, cover letter, interviews, LinkedIn profile, and in creating a network of people that support you. You will gain skills to "future-proof" your career, helping you become agile in responding to the rise of artificial intelligence (AI) and the rapid disappearance of more traditional jobs. You will gain motivation and support from a community of like-minded people with diverse backgrounds. Full-day Bootcamp facilitated by two experienced coaches. 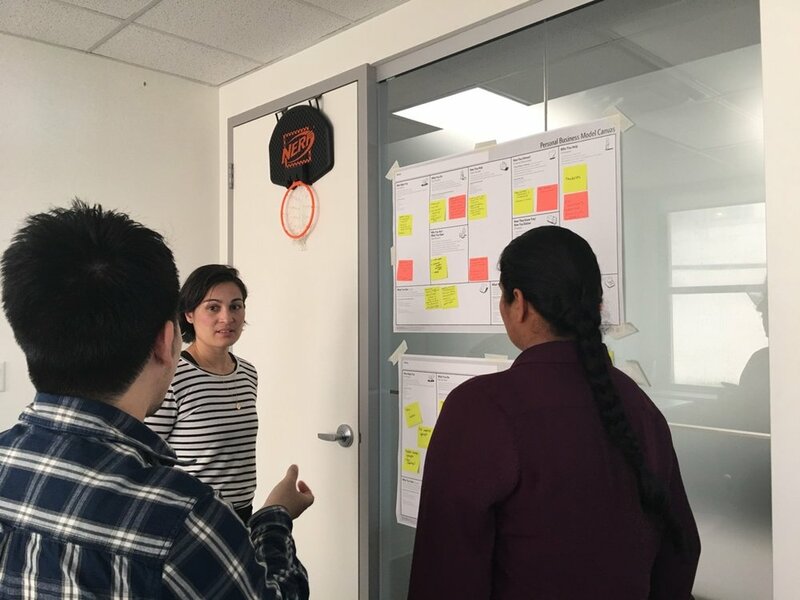 "Really enjoyed the visualization - Openned my eyes to what I want and value..." - Gaby R.
"Workshop is effective in gaining perspective and clarity. Also gets participants up for next steps with SMART goals." - Tony V.
"The flow of the day was very powerful. Plus the benefit of sharing the exercises with like-minded people is immeasurable. I'm empowered to try something that I dropped as an idea because why not! Rapid prototype. I can't fault it as a package. Excellent workshop, perfect level of casual vs. professional and very empowering." - Sam M.
Grab a spot at the special introductory rate before it expires! A curious mind and excitement! Check out photos from our last event! Book a free 45-minute sample session with Iris Cai at www.calendly.com/iriscai to see if 1:1 coaching is suitable for your needs. Forget about old school career counselling and join Iris Cai in this highly interactive workshop where you use design thinking techniques to unpack your career problems and opportunities, prototype various options, and design a strategy to unleash your career potential. 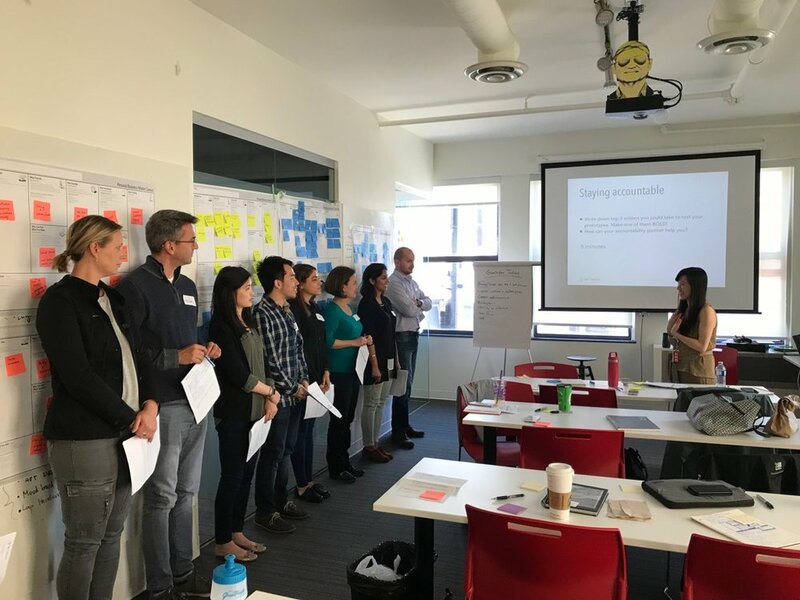 This previously sold-out workshop has been delivered to over 100 professionals including members of Lean in's Vancouver chapter and UBC's MBA students and have received repeated positive reviews. This time we are doing an encore supported by our partner, RED Academy, and guarantee it to be a fun and inspirational way to spend a Saturday afternoon! Note: For those unsure about the full-day Bootcamp, this would be a good entry-level workshop to attend to try out whether you like the style of the workshop. The insights gained from this event will prepare you well to attend the Bootcamp two weeks later. A pen and a letter-sized notebook/clip board to make your writing easy. We will provide a handout for you to do exercises on. Get the limited time offer or buddy offer ASAP to hold your seat! Check out photos from our past event! Designed specifically for mid-career professionals Career Reinvention Bootcamp draws from the innovative career development process introduced through the international bestseller Business Model You, a powerful four-stage method for drawing “personal business models” that show fresh ways individuals can adapt to changing marketplace needs — or create new, more satisfying work possibilities. Location: 1238 Seymour Street, Vancouver, ground floor amenities room (enter from Seymour). We stand by the service we provide. If you attend the full workshop and do not see value afterwards, we will gladly give you a 100% refund as long as you provide us with some feedback. As you kick off 2018, have you wondered what can be done to get more out of your career? Have you contemplated having a bigger change but don't know where to start? 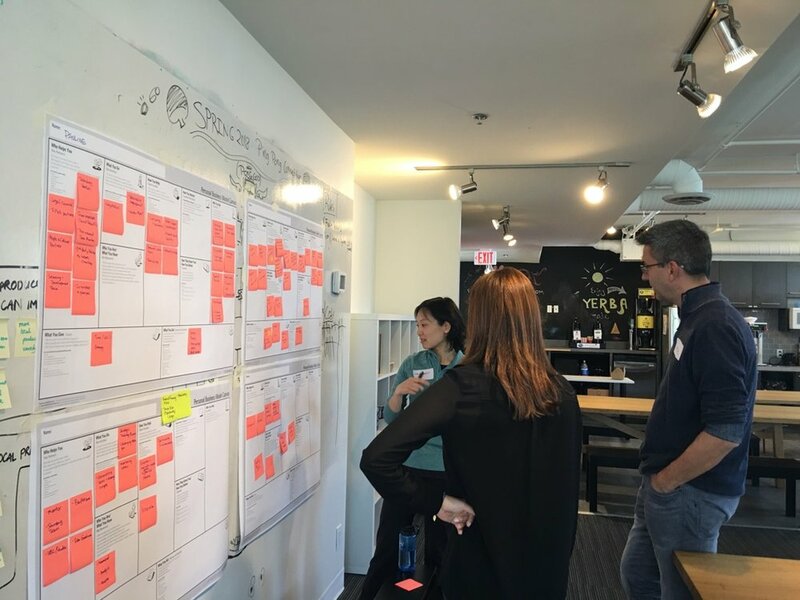 This previously sold-out workshop was first delivered at Lean in Vancouver's January event to 50+ professionals and received great reviews from an engaged audience. This time we are doing an encore with a much more intimate group of 20 and guarantee it to be a fun and inspirational way to spend a Saturday morning! 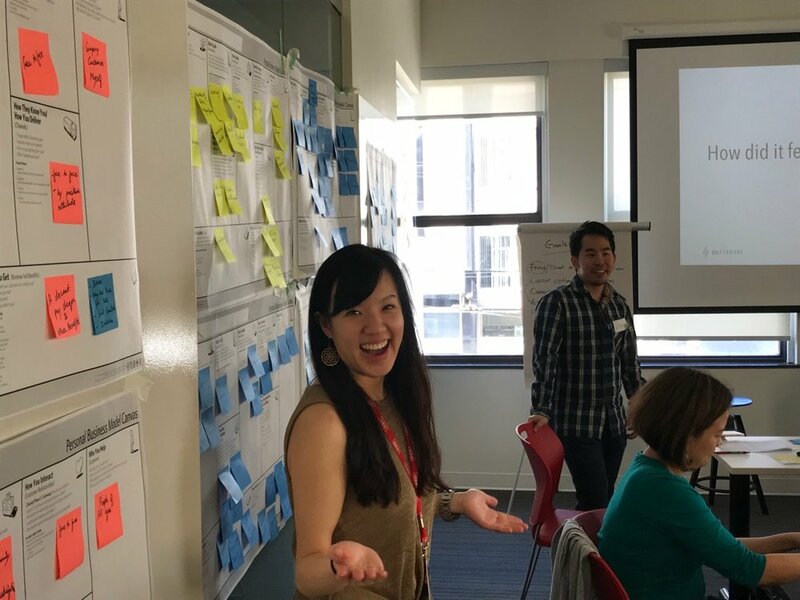 Join Iris Cai in this highly interactive workshop where you use design thinking techniques to unpack your career problems and opportunities, prototype various options, and design a strategy to unleash your career potential. Connections with a group of like-minded people who are driven and committed to having an authentic career like you do. Note: For those unsure about the full-day Bootcamp on February 17, this would be a good entry-level workshop to attend to try out whether you like the style of the workshop. The insights gained from this event will prepare you well to attend the Bootcamp two weeks later. Share this event with your friends and colleagues!